Only 7 months into a 2 year contract, poor cellular reception and shoddy Samsung craftsmanship has led to the demise of my relationship with T-Mobile. It wasn’t all for naught though. The little time spent with Gingerbread (Android OS 2.3.x) clearly demonstrated that the gap between iOS and Android is non-existent at this point. Sorry Apple fanbois, but it’s true. Google integration (maps, Gmail) is much better, sound and theme customization is available out of the box, etc. But this isn’t an Android vs. iOS post, so I’ll stop there. Back to the phones…The Nexus S phones lack quality materials which is surprising given that the Nexus S is Google’s flagship phone. Not using Gorilla Glass or equivalent really isn’t keeping up the Joneses, err iPhone. Then again, Apple’s decision to use regular glass on the back of its iPhone isn’t exactly making it bomb proof either. Regardless, at least the Nexus S fits nicely in hand with its curves and weight. Speaking of curves, the glass screen is curved a bit. Samsung/Google claims it’s for better face fit. I honestly can’t say whether that’s true or not. 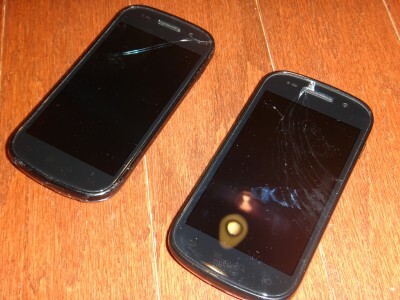 All in all, my time with the Nexus S didn’t leave me wanting another, now that it’s available on AT&T. Update: After a bit of activation trouble, I’m back in the office with a number of AT&T backed phones. Reception in the office has been restored.